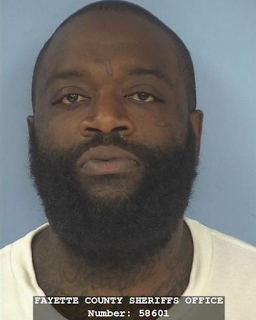 Rick Ross, who was arrested earlier this month for marijuana possession, was arrested again last night at his home in Fayette Atlanta for pistol whipping a contractor working on his house. According to reports, the rapper found the man eating his food and 'stealing little things' at his home which is being renovated and attacked him. Police showed up after the man called them to report assault. According to reports Rick Ross and his bodyguard were taken into custody & booked on kidnapping, aggravated assault and aggravated battery charges. They are currently awaiting a bond hearing.